In a final between the third and fourth seeds, it was Egypt's Mohamed Abouelghar who prevailed, beating Peruvian Diego Elias in a see-saw five game final to win the Motor City title, and a lovely new watch ! 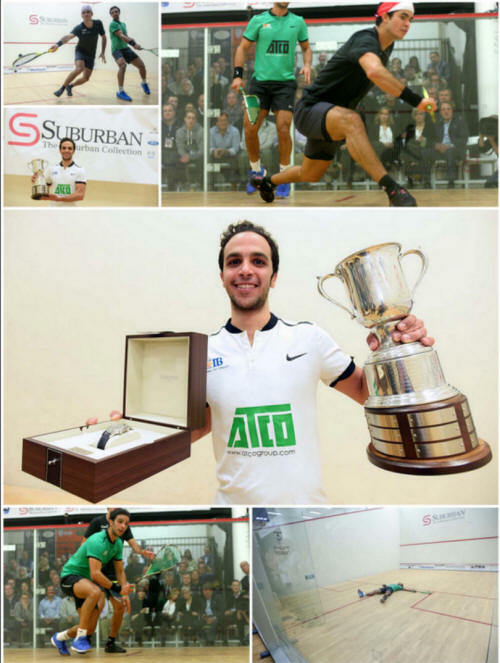 There will be a new squash champion on Saturday at the Motor City Open. Four former MCO champions came to Detroit this week hoping to become the third two-time champion in the pro squash event’s 20 years. 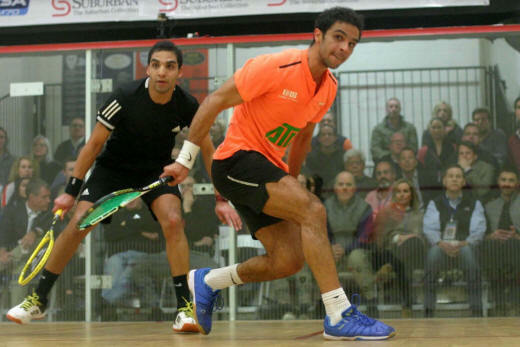 All of them fell throughout the week though, as Diego Elias of Peru and Mohamed Abouelghar of Egypt assured there would be a first-time MCO champion, Elias beating top seed and defending champion Marwan ElShorbagy in straight games, Aboulghar ending the run of unseeded compatrion Zahed Salem. Three of the top four seeds advanced Thursday to the semifinals of The Motor City Open presented by the Suburban Collection. 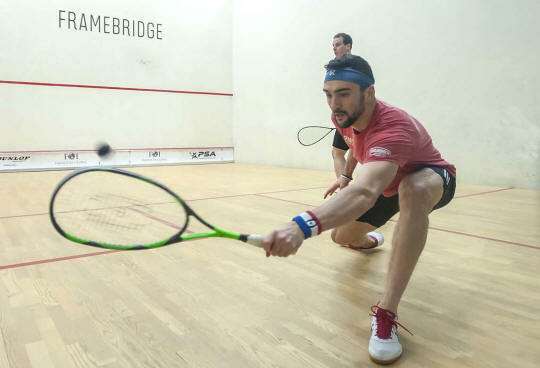 Zahed Salem made it three Egyptians in Friday’s semifinals, knocking off second-seed and the 2015 MCO champion Miguel Rodriguez of Colombia in four-games at the Birmingham Athletic Club. 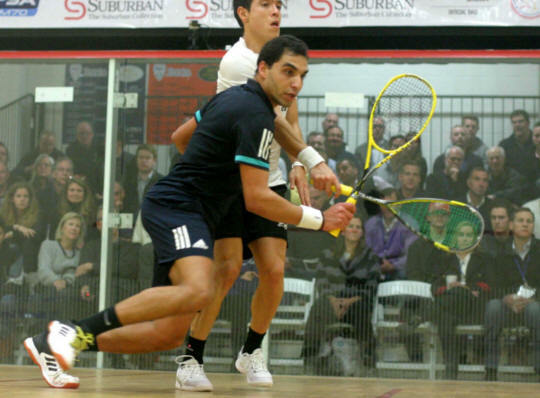 In Friday’s semis Salem will meet close friend and countryman Mohamed Abouelghar, the third seed and World #10. 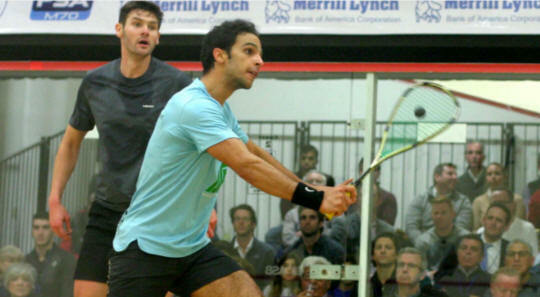 It will be a rematch of the finals in Guatemala a few years back, which Abouelghar won against a hobbled Salem. 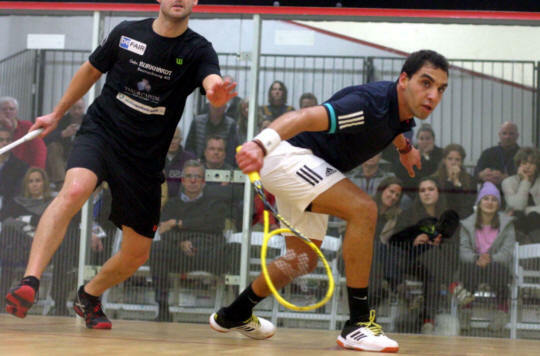 In earlier quarterfinal matches, the higher seeds held as top-seed Marwan El Shorbagy of Egypt topped seventh-seeded Omar Mossad in three games. Fourth-seed Diego Elias of Peru topped #5-seed Ryan Cuskelly of Australia, who retired with an illness after two games. 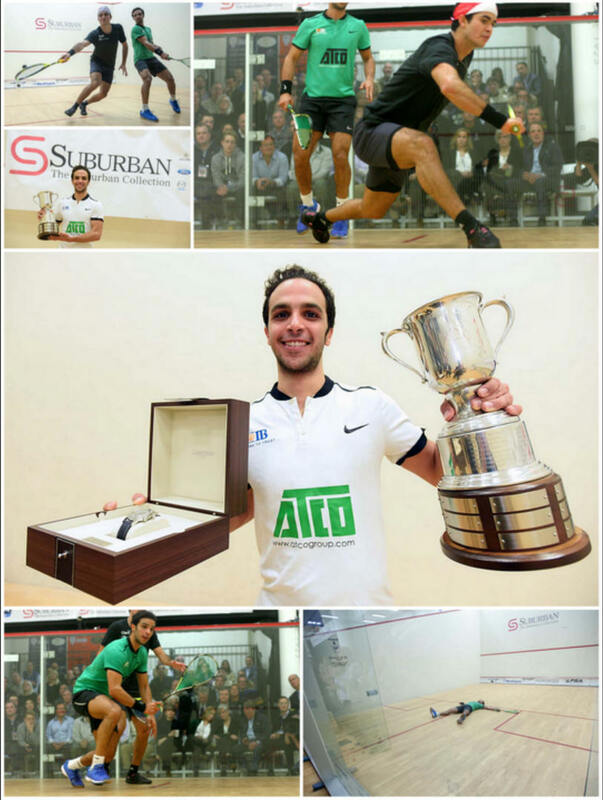 El Shorbagy, the defending MCO champion, lost to Elias in four games at last week’s J.P. Morgan Tournament of Champions in New York. 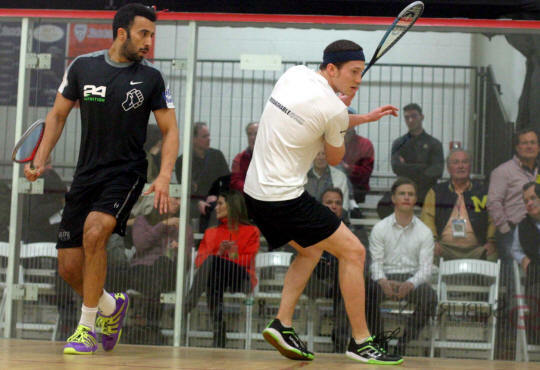 Two seeds fell in upsets and three former champions moved on in Round of 16 squash action at the Motor City Open. Adrian Waller of England and Zahed Salem of Egypt topped seeded opponents and will play in Thursday’s quarterfinals, seeking their third win in as many days at the Birmingham Athletic Club. Waller pulled the biggest upset of the night, knocking off sixth-seeded Raphael Kandra of Germany, World #17, in a five-game, 70-minute thriller, winning from 4-6 down in the decider. 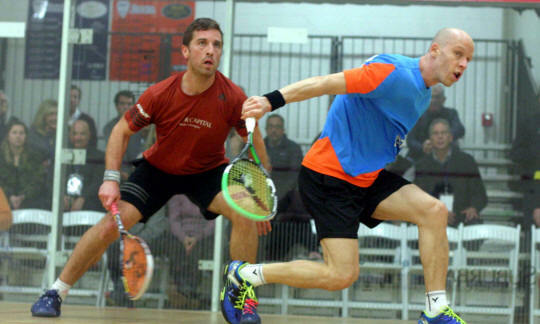 Salem closed the night with a five-game victory against eighth-seed Nicolas Mueller of Switzerland. Four of the eight quarterfinalists are from Egypt, the country that has won six of the past nine MCO titles. The top-five seeds, including three former MCO champions, will headline the quarters. 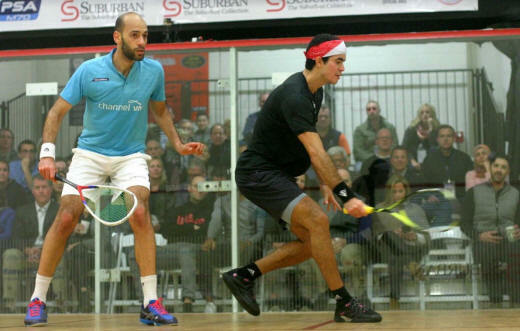 Top-seeded Marwan El Shorbagy of Egypt, the defending MCO champion and World #5, won in four games against countryman Mazen Hesham. Second-seeded Miguel Rodriguez of Colombia, the 2015 MCO champion and sixth-ranked player in the world, dropped the first game to Mathieu Castagnet of France, but recovered to take three straight. Fifth-seed and 2017 champion Ryan Cuskelly of Australia cruised in three games over Spain’s Iker Pajares Bernabeu, who had played a marathon 95-minute match the day before. Diego Elias of Peru advanced after his opponent. Cesar Salazar, withdrew with an injury in Game 3. Chris Hanson and Todd Harrity became the first two Americans to earn main draw victories in MCO history on Tuesday, but both fell on Wednesday despite good showings. 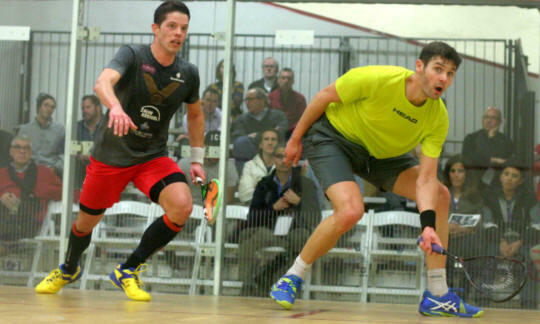 In the first 19 years of the Motor City Open presented by the Suburban Collection, no U.S. player had ever made the main draw of the pro squash tourney. Now, after just one day of the 20th annual event, two have victories. Americans Chris Hanson and Todd Harrity cruised to three-game wins to move on to Wednesday’s second round at the Birmingham Athletic Club. Hanson and Harrity moved on to the Round of 16 along with six other winners Tuesday night. Waiting for them are the eight seeded foes, who each received byes through Round One. Hanson will have a rematch with seventh-seed Omar Mossad of Egypt on Wednesday. The pair met last week in the J.P. Morgan Tournament of Champions in New York with Mossad winning in three games. While the Americans had relatively smooth sailing, the most entertaining Round 1 match was the opener. Spain’s Iker Pajares battled back twice from a game down, outlasting Chris Simpson of England in 95-minutes, 8-11, 11-9, 7-11, 11-7, 11-9. Tuesday was likely the final MCO match for 2007 champion Olli Tuominen of Finland, a crowd favorite. After Tuominen lost to Mathieu Castagnet of France in three hard-fought games, the Birmingham Athletic Club crowd recognized his history at the MCO, chanting “Olli! Ollii! Olli!” for the 39-year-old. Tuominen said this is his final year on the Professional Squash Association World Tour.